Smoked Shoyu Tonkotsu Ramen, with Truth Barbeque smoked brisket. Photo by Shion Aikawa. On Monday, April 9, the Houston outpost of Ramen Tatsu-Ya is welcoming Leonard Botello IV, pitmaster and owner of Brenham’s acclaimed Truth Barbeque, for his first-ever collaboration in Houston. The ramen shop and barbecue joint is rolling out a Smoked Shoyu Tonkotsu Ramen from 5 p.m. until sold out. The smoky, savory dish is made with pit-smoked shoyu (soy sauce made with ingredients that usually include wheat for a slightly sweet flavor), a slab of Truth Barbeque brisket, ajitama (marinated, soft-boiled egg), and menma (fermented bamboo shoots). Ramen Tatsu-Ya executive chef and owner Tatsu Aikawa, and his brother, director of operations Shion Aikawa, will be there to greet and hand out free beers to guests. The smoked shoyu flavor is characterized as “deep, warm and woodsy”—the perfect pairing for the simply-prepared Truth Barbeque brisket. The brisket meat is sourced from 44 Farms, widely touted for its silky, rich fat content. Brisket Tsukemen. Photo by Carla Gomez. The barbecue-meets-ramen union is one that Ramen Tatsu-Ya has been cultivating for a long time. In 2012, they opened their first ramen shop in Austin to much critical acclaim. 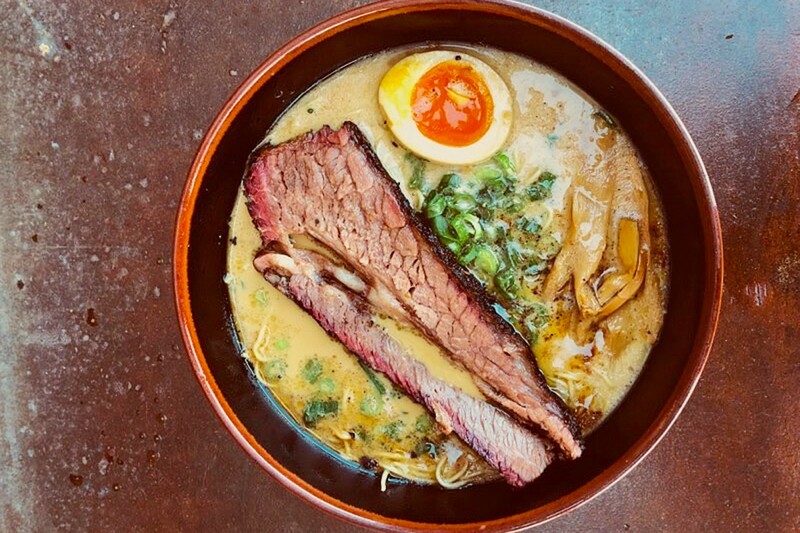 Then, in 2013, they began making featured ramen bowls made with brisket by Trento Italian Restaurant, Franklin Barbecue and then ultimately with a housemade product. This is not Houston’s first introduction to brisket ramen. Texas Ramen with smoked brisket had a limited run in 2014 at Soma Sushi, while under the guidance of chef Mark Gabriel Medina. It is, however, one of the first of what’s likely to be many future collaborations between chefs in Houston and the talented Leonard Botello of Truth Barbeque. He plans to open a Houston outpost in the former J. Black’s location on Washington Avenue sometime in 2018. 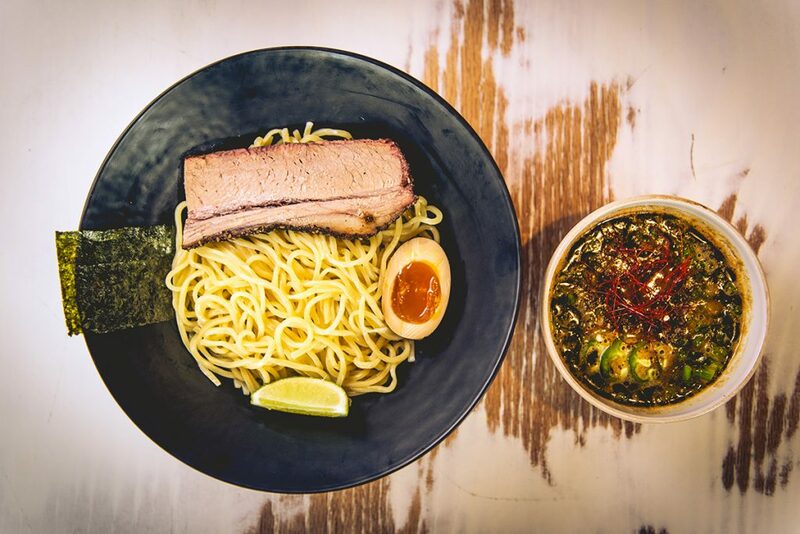 In addition to the Smoked Shoyu Tonkotsu Ramen, Houstonians can get a taste of the Japanese-soul-food-meets-Texas-barbecue magic with Ramen Tatsu-Ya’s Brisket Tsukemen, made with a broth created from brisket burnt ends, cumin and jalapeños. The accompanying noodles are topped with a hefty slice of Kemuri Tatsu-Ya brisket (from the company’s Japanese Izakaya and Texas smokehouse spot in Austin). The Brisket Tsukumen is now available at the Houston location every Thursday from 12:30 p.m. until sold out. Crawmen, with a spicy crawfish-seafood miso-tonkotsu broth. Photo by Carla Gomez. 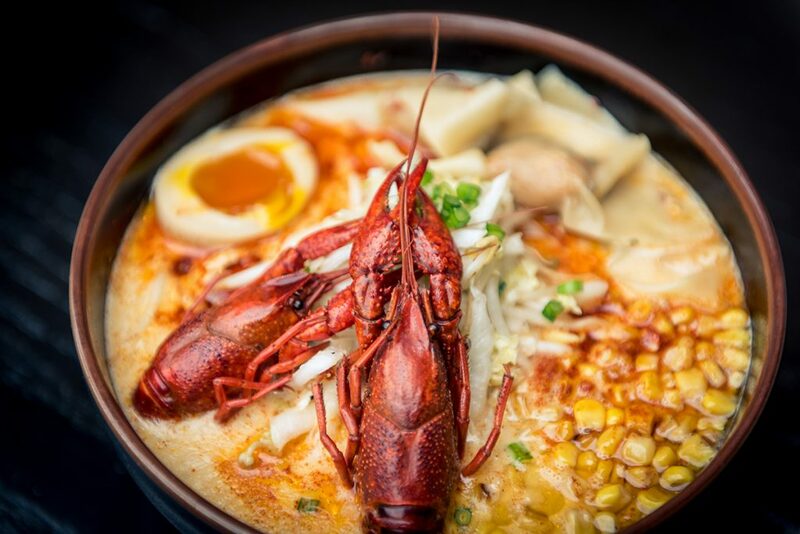 Not to leave out spring crawfish lovers, Ramen Tatsu-Ya also debuted Crawmen on April 2, a picturesque fusion of crawfish–seafood–miso tonkotsu broth, crawfish and andouille wonton, ajitama, cayenne, and smoked paprika. The Crawmen ramen special will be available at Ramen Tatsu-Ya through the end of May. Ramen Tatsu-Ya, 1722 California St., Houston, Texas 77006, (346) 226-3253. Open daily 11 a.m. to 10 p.m.